Service to humans isn’t just for the dogs. Mini horses can do the same work and live decades longer than dogs. Minis can easily live beyond 40-years-old. Check out the mini, Magic, who was named the Most Heroic Animal in America: http://www.horse-therapy.org/Hero.htm. She has helped an elderly woman speak for the first time in three years; helped a dying man pass gently; and was there to help a man who awoke from a coma as she entered his room. 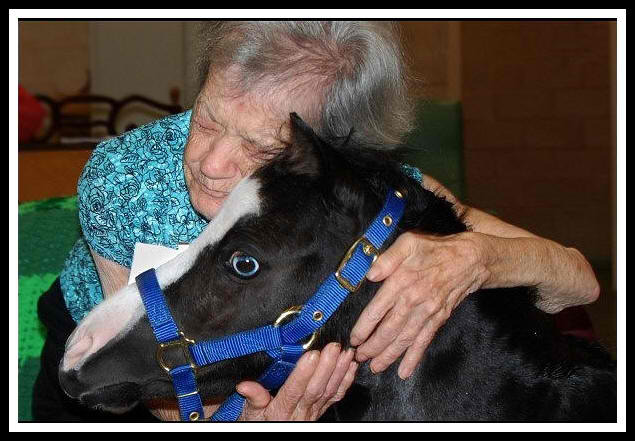 This entry was posted in Animals, Health, Horses and tagged Gentle Carousel Therapy Horses, healing, horse therapy, Horses, magic, mini horses, Therapy Horses. Bookmark the permalink. Sweet Magic! How I adore those little minis! They’re… SQUEE! Right? What could be better than a little Magic in the home?